Uk producer Low:r (Ben Downton) was always interested in sound from a young age, from playing instruments, being in bands or just bashing pots and pans with spoons, he later moved on to playing music at local parties,Skate competitions and events. His first DAW was a present from his brother in 2004 and he quickly got into making Electronica and Dub music which eventually lead to his love of minimal Dubstep in 2006/7. He then moved on to making Drum & Bass in 2011 when he met fellow producer Locustlung. They went on to write a techy 4 track EP that broke into the top ten on Drum & Bass Arena’s charts and was supported by Phil Tangent and a few podcasts. Currently his favorite Djs and producers include the likes of Logistics, Calyx & Teebee, Alix Perez, Fred V & Grafix, Bonobo and Submotion Orchestra to name a few. 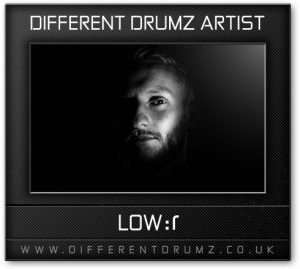 Now in 2016 Low:r is set to release his first 5 track EP (Ebb N Flow) featuring one track including the vocalist called SiiLHOUETTE on Such Music, and another 3 Track EP (The Movement EP) featuring Carl Petros due for release on Different Drumz Recordings.